← Is Using A Natural Heartworm Preventative Worth the Risk? Having a pet is a tremendous responsibility. Dogs face many threats of disease caused by parasites. The challenge for pet owners is protecting their furry family members from preventable diseases and effective tick treatment is a very important part of this. Keeping your dog safe and healthy is not always easy. While you provide the comforts of a loving home, great food and treats, your pet needs protection from parasites. Heartworms in dogs are a growing problem however, diseases caused by ticks are also becoming a problem. Many pet owners do not realize how serious and debilitating these diseases can be. Ticks are an external parasite that attach to the dog’s skin. They continuously feed on the blood. 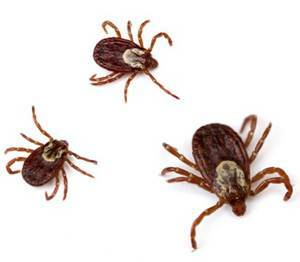 The ticks will remain attached to the skin and will grow in size due to becoming engorged with blood. They are usually brown or gray but the color may change as the parasite feeds and grows. Ticks are found anywhere in the outdoors. If you take your dog on long walks in the woods or rural areas, there is a higher chance he will pick up ticks along the way. If you have a number of trees and bushes in your back yard, your pet may be at risk for getting these pests on your own property. Unfortunately, dogs are outdoor animals and there is always the risk of getting external and internal parasites. There are pest control companies that will provide tick treatment for your outdoor areas if this is a problem. Lyme Disease is the most common disease caused by these parasites. This disease is caused by the Borrelia burgdorferi bacterium. A black legged tick often referred to as deer tick is the most common transmission vector of Lyme disease. Lyme disease is difficult to detect and symptoms may not present until a few months after the initial infection. The disease is painful and debilitating once the symptoms become visible. Some of the symptoms of Lyme disease are fever, swelling in the joints and lameness. In addition, your dog may refuse to eat and become lethargic. One of the most noticeable symptoms is a dog’s unwillingness to move. This disease can cause tremendous joint pain, which will cause him to try to avoid any movement. In severe cases, Lyme disease can cause kidney failure. Canine Ehrlichiosis is another common disease caused by ticks. Ehrlichiosis is caused by the Ehrlichia canis bacterium transmitted by brown dog ticks. Like Lyme disease, the symptoms may not be detected until months after the infection has developed. The most common symptoms are runny nose and eyes. In addition, affected animals will experience high fevers and loss of appetite. The most frightening signs of the disease are bloody noses and bruising on the gums or belly. Severe cases of the disease that go untreated can result in death. Canine Anaplasmosis is often referred to as dog fever. Deer ticks are responsible for transmitting the Anaplasma phagocytophilum bacterium. If your pet is infected, the most common symptom is high fever. In addition, your dog may experience diarrhea and vomiting. In advanced stages of the disease, affected animals often have intense neck pain and seizures. Ticks can cause many diseases in dogs. The risk of infection depends on the area you live. Lyme disease is prevalent in most parts of the world. However, most of these diseases are limited to specific regions. To find out if your pet is at risk for any diseases associated with these horrible pests, visit your veterinarian. When veterinarians notice an increase in specific disease, they often send health warning notices to inform their clients about the disease and treatment options. If there is a particular disease in your area, your veterinarian will make appropriate prevention recommendations. While it seems protecting your pet’s health is a tremendous challenge, you can protect your pet with preventative treatments. If your pet is currently on a brand of heartworm treatment for dogs, it is likely the brand has a preventative that includes flea and tick treatment. If the brand you currently use does not have a comprehensive preventative treatment, ask your veterinarian for recommendations. If you have to change brands, it is important to consult with your veterinarian before switching medicines. You want to make sure that switching treatments does not cause an unwanted reaction. Whilst these types of reactions are rare, they do occur in a small percentage of dogs. Choosing a heartworm treatment that includes flea and tick treatment is the most effective method to keep your pet healthy. With one monthly dose, your pet will be protected from several potential debilitating diseases. In addition, you will have peace of mind knowing you are doing all you can for your precious family member.